Aye Nyein Aung’s career got off to a bumpy start when she spent her first day on the job at a shoe shop in tears. Here’s how she was able to learn from the experience and, years later, become one of Proximity’s rising stars. It was hardly the fresh start Aye Nyein Aung had imagined. The 19-year-old business administration student had only arrived in her new home of Singapore just a few weeks ago and was excited to start her first part-time job in a shoe shop. “I just couldn’t wait to get the experience,” said Aye Nyein Aung, known by her colleagues as Ana. But just an hour into her first shift, her expectations came crashing back down to earth. But that unsympathetic manager would end up instilling in Ana, a natural introvert, many of the skills which would make her an essential member of Proximity’s Farm Advisory Service years later. 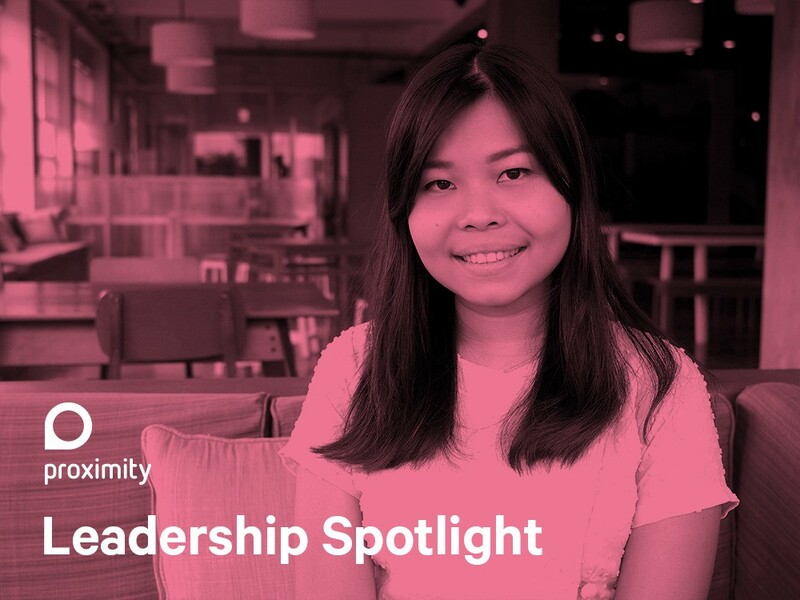 Ana returned to Myanmar after completing her degree in Supply Chain Management and eventually joined Proximity’s Farm Advisory Service (FAS) as Operations Associate in 2016. As an intermediary between the Yangon office staff and the field staff, Ana spent her first three months developing relationships with all of the extension officers in her unit and meeting with customers to get familiar with the language of agriculture. The world of farming wasn’t entirely new to her. As a young child, Ana spent many summer holidays on her auntie and uncle’s paddy farm in Phaung Gyi. It was here, playing around stacks of fertilizer bags and piles of rice with her cousins that she witnessed first hand some of the hardship farmers go through. “I remember my auntie and grandparents always saying ‘this year we have no profit, we’ve lost everything,’” she said. When Ana joined, FAS was growing rapidly. This, combined with Proximity’s flat structure which rewards people taking initiative, meant she underwent a steep learning period in the first few months. One of Ana’s first major assignments was training field staff to improve customer engagement . Her effort and dedication quickly caught the attention of her colleagues and she was soon offered to take the lead role in several pilot projects. The first two, a seed distribution pilot and a land levelling pilot, required Ana work jointly with different Proximity teams. It was working with the design team, in particular, which gave her valuable insight into the entire project development process, from the design phase to piloting, to the launching of a new product. In mid-2017 Ana took on a new project. The brief was to create a user-friendly soil health test service for which Ana and the design team spent months traveling the country to speak with more than 100 smallholder paddy farmers. With the pilot proving a success, the final phase of the project was given the go-ahead by management and Ana took on the role of Soil Health Diagnostic Service Manager. Now leading a small team comprised of an agronomist, a soil scientist and a lab coordinator, Ana has to decide in which townships the service operates, organize trainings for field staff as well as maintain the inventories and budgets of soil test labs across the country. The service launched in 11 townships in August and by the end of September will be operating in 18 more.